I thought I could do without any baroque footwear, not to mention while I have promised that now I do not want to rush of shopping, especially at the shoes and I am not going to absorb of whatnot kitschy stuffs - well, apparently not. 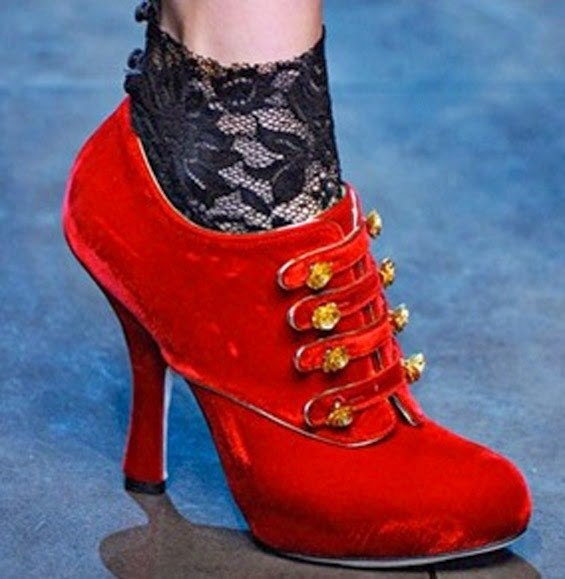 I fell in love online of these red velvet booties (attached tonal lace socks with red mini buttons) by Dolce & Gabbana. Available in black here and my other pair is from this collection last seen here.) I am following to careful with it and I am glad to put my hand on these and I do not overdo same arty things. I will make a choice rather simple pieces to this pair. I am thinking about all of black or navy outfits... Lace dress? Maybe it will be bit of kitschy? What do you think?